Flash cards are a interesting, simple, versatile, yet often underexploited resource. A free service for make intelligent study flashcards that can be shared with others. Check out the PDF file below: How are you? - Wie geht’s? "Even if you can’t have a fluent conversation, native German speakers always appreciate when foreigners put the effort into learning a bit of their language"
You won’t be totally reliant on your German phrasebook. After learning the German words and phrases, you’ll only need your German phrasebook in a real pinch. "The perception that all German-speaking people speak English is simply not true. Even in big cities you will find many people who know very little English." "... You don't want to track down other English speakers every time you have a question or want to make a friend ..."
"... It’s important to know basic shopping expressions in German ..."
Study your cards easily at home, at school, at Institute, at work. 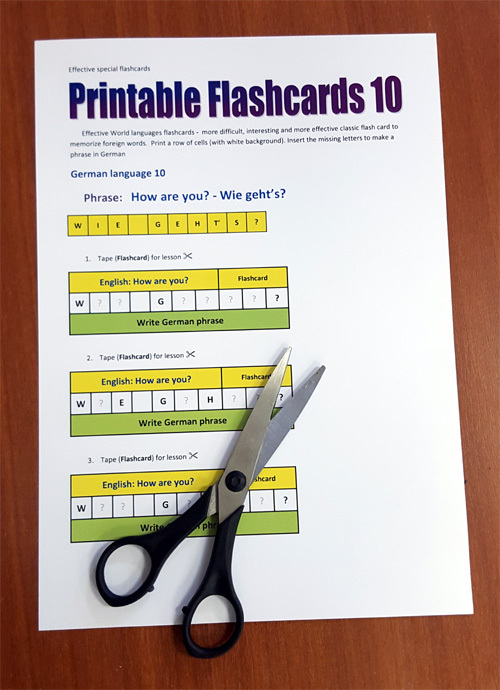 "... Use this intelligent flashcards to make learning to read, write and speak World languages faster and easier ..."
"... Download this PDF file. Load file into free Adobe Acrobat Reader. Then use PDF image to print advanced flashcards! ..."